Freshly painted interior walls can breathe new life into your home. Just think about how different your kitchen, dining room or bedroom will look with a simple color change. Without making any major remodeling changes, wall painting is a quick and painless way to completely transform every room in your house. There are over 3,000 paint colors for you to choose from. These can either have a flat or satin finish, depending on what sheen you prefer. Be sure to ask about our free color consultation, and as always, our interior painting service provides free paint for you to try on your walls before our painters arrive! A new paint color can literally change the entire look of a room. It is often the most cost-efficient way to remodel and update your home. Many homeowners that have larger wall areas choose a modern taupe color or decide to accent specific walls with a deep dark color. The choice is yours; the color possibilities are endless! 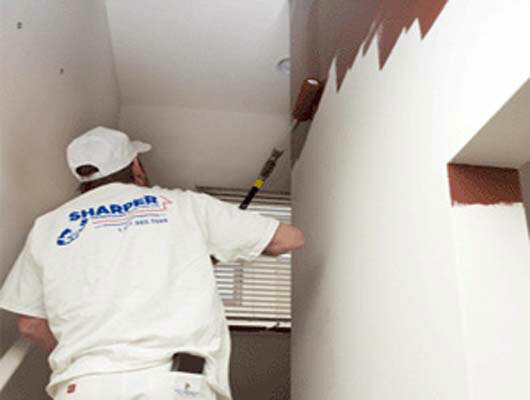 Sharper Impressions guarantees the best wall painting services for your home. No matter the age of your current paint color, we will make sure the drywall is smooth and professional looking before we start painting, so the final paint product is rich and luxurious. Looking for wall painting services to give your home a fresh look? Call Sharper Impressions Painting today to schedule a free estimate, or request a free quote by filling out the form below!